Folder-Inserters are machines that automatically fold paper, stuff it into an envelope, then seal it. 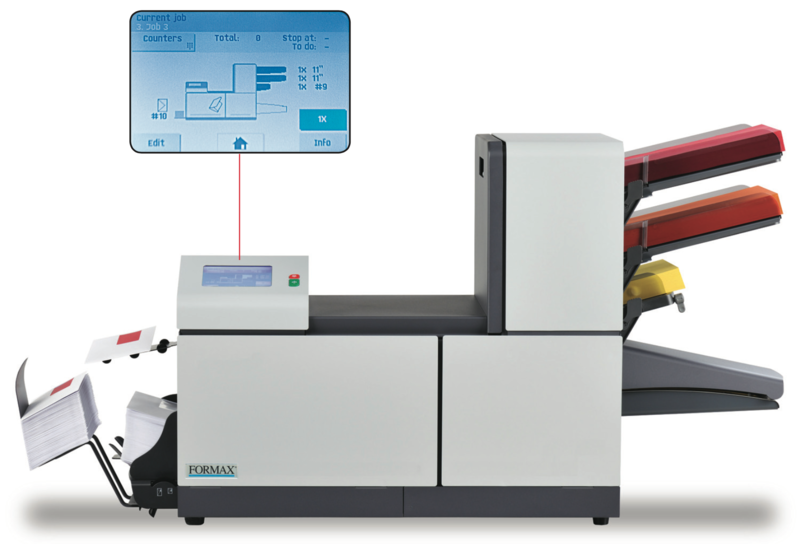 We carry the Formax line which has 7 series of folder-inserters. They vary in the number of pieces that can be put into an envelope and in monthly volume. The entry level FD6102 can take one each from 3 feeders and process up to 5,000 envelopes monthly. The 7200 series which can stuff up to 50 into an envelope and process up to 200,000 envelopes per month. There are a number of options, including Bar Code and Optical Mark Recognition, which for example, allow you to print invoices with varying number of pages per recipient and automatically have them put into the right envelope. Our optional Mail Doc software can be easily set up for this. See the Folder-Inserter Comparison Chart for details. We will describe the FD6204 Advanced 2, the most capable of the 4 models in this line. It has 2 sheet feeders and one insert feeder. Sheet feeders fold and insert, while insert feeders only insert items such as a card, folded brochure or reply envelope. Folder inserters have limitations on the number of pieces they can pull from a feeder and/or put into an envelope. The maximum the 6204 can put into an envelope is 5 pieces, with up to 3 coming from 1 feeder. For example, it could take a 3 page letter from feeder 1, a flyer from feeder 2, and one card or reply envelope from the insert feeder. It is built to process up to 15,000 envelopes per month. It accepts letter or legal size, but not glossy paper. If you regularly stuff more than a few hundred envelopes per month, you will save time and money with a folder-inserter. If you prefer to lease, the FD6102 folder inserter lease starts at $160/month. The FD6204 comes with 1, 2 or 3 feeders. It has a large screen for creating or selecting your saved jobs that makes processing easy. The Advanced 2 has 2 sheet feeders and one insert feeder. Feeder 1 is at the top right, feeder 2 is below and the insert feeder below that. The grey part sticking out is where the paper is collated together. The set is then sent from right to left through the machine where the set is folded. Unlike some brands, the rollers are all internal, making the machine very quiet. The envelope in the lower left of the machine is pulled into the machine from the bottom, opened, and receives the folded set. You can seal or not. The completed envelope drops in the tray at the far left. You set up the job in the control panel. Nine jobs can be pre-programmed. If these jobs do not fit your needs, you can create your own settings for paper size, number of pieces per feeder, and whether to seal or not. After selecting the job, You can set the counter or just press START STOP to begin. It will stop if you run out of paper, hit the number you set in the counter, or press the START STOP button. If you are inserting more than one piece in the envelope, the machine collates the pieces and folds them together rather than one at a time. Cards or reply envelopes are nested. If you need to fold more than the machine can automatically process, all machines have a function called daily mail in which you manually insert up to 5 sheets, stapled or not, and the machine will fold and insert the set into an envelope. Access to the inside of the machine is very easy. A lever near the top allows you to fold back that cover and the lower cover for complete access. You do this to check the envelope sealing mechanism, periodically clean the rollers and to clear any jam that might occur. It seals the envelope by passing the flap across a water moistened pad. The water tank is filled from the other side of the machine. All folder-inserters must use the type of envelope shown. It is generally a standard #10 commercial envelope. The flap is V shaped and has rounded corners as shown in the example. If reply envelopes are used, they should be #8 size with similar construction. Some of the higher rated machines can accept 6.5" x 9.5" or 10" x 13" envelopes. Whatever the size, the flaps must be shaped like this. If you need an envelope supplier, we can recommend one. All folder-inserters work like the FD6204, with varying speed and capability. The most capable is the FD7200 shown below which can put up to 50 sheets of paper into a flat envelope and take paper from up to 11 feeders. Options for most machines include higher capacity feeders, bar code readers, optical mark readers, etc., that can perform just about any inserting job. 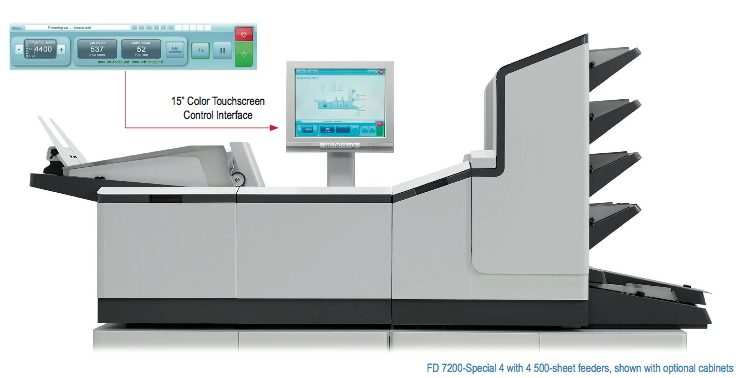 The FD7200 is rated to process up to 200,000 envelopes per month. See Selecting the Right Folder-Inserter for a comparative chart of all models. Call us for help or to confirm your choice. 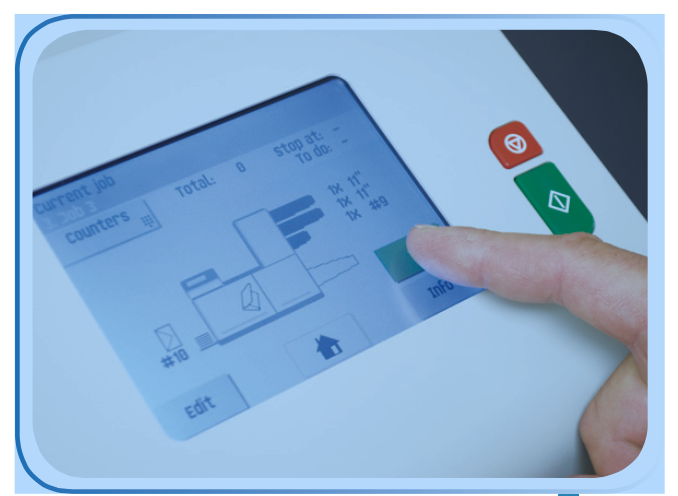 You will save time and money with a folder-inserter if you process more than 500 envelopes per month. You will also make the people now performing the work very happy. Please call us to discuss your needs. We will recommend the right machine for you.